Giffords 'Recovering Well' After Skull Surgery : The Two-Way The congresswoman now has a patch on her skull. She's recovering from the severe injuries she received when a gunman attacked an event she was holding in Tucson on Jan. 8. Six people were killed. Thirteen, including Giffords, were wounded. 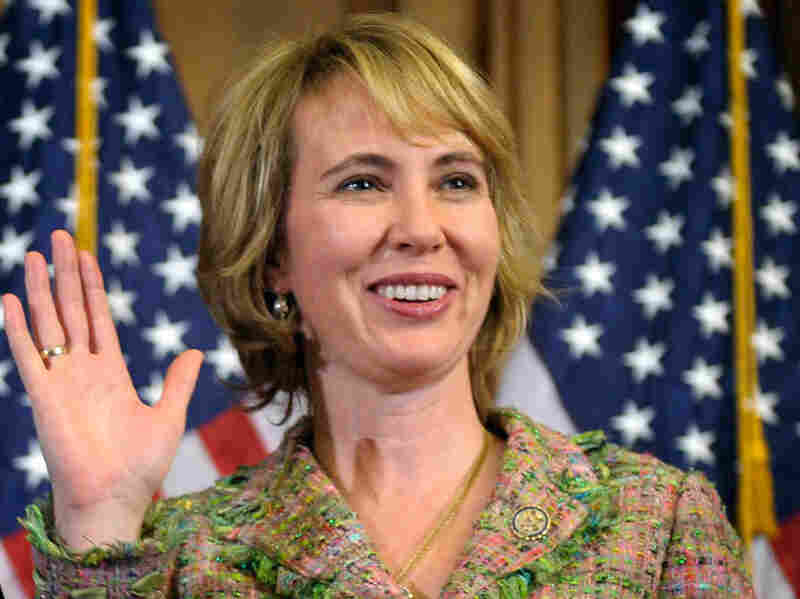 The surgery Wednesday to put a patch on Rep. Gabrielle Giffords' skull went as planned and the Arizona Democrat is "recovering well," according to officials at the Memorial Hermann-Texas Medical Center. That's the Houston hospital where she is getting rehabilitation treatment for the gunshot wound she suffered during a Jan. 8 attack on an event she was holding in Tucson. In this Jan. 5, 2011 file photo, Rep. Gabrielle Giffords, D-Ariz., takes part in a reenactment of her swearing-in, on Capitol Hill in Washington. Six people were killed and another 13, including Giffords, were wounded during that rampage. As Nancy Shute explained over at the Shots blog, "after a person suffers a brain injury, neurosurgeons often take out a chunk of the skull so that pressure won't build up in the brain. Later, though, that hole needs to be patched." Dr. Henry Brem, neurosurgeon-in-chief at Johns Hopkins Hospital in Baltimore, talked with her about the cranioplasty surgery Giffords had on Wednesday. As NPR's Ted Robbins adds, the plastic implant is "molded perfectly to the rest of her skull." Giffords should be able to move about more freely, he reports, since her brain is now protected by that implant. Giffords' doctors and her chief of staff are due to brief reporters about her condition later this morning. Update at 1:45 p.m. ET: "A day after surgery to repair her skull, Arizona Rep. Gabrielle Giffords' doctor has dubbed her 'gorgeous Gabby,' encouraged by how she looks and is communicating after an operation considered a major milestone in her recovery from a gunshot wound," The Associated Press reports. Meanwhile, her astronaut husband — Mark Kelly — said from aboard the space shuttle Endeavour that "she's doing really well. Everything went as planned."